Marine Phytoplankton, a foundational part of the oceanic food chain, is the most ancient plant on our planet, containing a wealth of bio-available vitamins, minerals, antioxidants, all 10 essential amino acids, enzymes, proteins, carotenoids and fatty acids, as well as the benefits of antioxidant super oxide dismutase. We believe this magical substance is the most exciting green supplement on the planet, and with tremendous benefits to a wide range of health conditions. In fact, our experience of taking this was so profound, we began our search for the single most potent, pure and effective marine phytoplankton supplement on the market. During the course of our research we personally ordered and compared every available product from the European, Asian and US markets. When we finally tasted the Health Factory’s product, it was like a lightning bolt. The purity, power and sheer effectiveness of the powder was so far ahead of the others, it simply blew our minds. Is Marine Phytoplankton the World’s Healthiest Green Supplement? Beyond the superb nutritional profile of the phytoplankton, its tiny size is behind some of its health benefits. Phytoplankton are the smallest plant-based organisms on the planet, 5-7 times smaller than a human red blood cell and, as a result, phytoplankton is absorbed by the human body in a way which bypasses the mitochondrial system. This critical factor may explain the life-changing benefits many people report when ingesting marine phytoplankton. Testimonial after testimonial recounts people who have spent thousands of pounds on health supplements without taking anything that has affected them so radically. Put simply, phytoplankton is a supplement the body can absorb. Please bear in mind, however, that ingesting a cheaply produced pond grown plankton is not going to deliver you these benefits. There is a reason phytoplankton hasn’t made it to the human food chain beyond the last decade, it requires complicated technology to produce in its purest state. As time goes by, the scale of production will bring the price down but for now, it is a premium supplement for those looking for the ultimate health giving green powder. Click here to read our marine phytoplankton reviews. What is Marine Phytoplankton Good for? Phytoplankton is a single-celled micro-algae, the world’s most ancient plant and one of the origins of life on this planet. As a food and nutritional supplement, phytoplankton contains a complex mixture of vitamins, minerals, and antioxidants, including the highest vegetarian and vegan levels of the EPA and DHA. Importantly, these fatty acids are the long chain (more bioavailable) form, commonly found in oily fish. 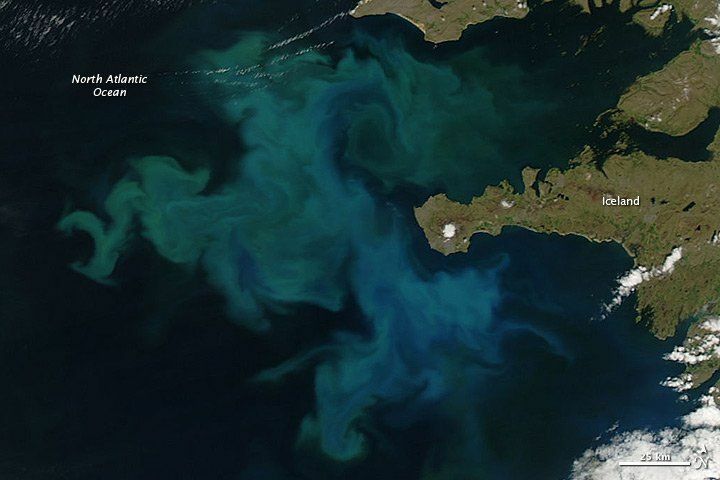 Although phytoplankton can achieve incredible biomass in a short space of time, for much of the year, wild strains have their growth constrained by imperfect growing conditions. These sensitive organisms depend on just the right combination of nutrients and light, so when the right weather conditions arise their growth has a pace and magnitude which is one of nature’s most extraordinary phenomenon. As illustrated below, these blooms can be seen from space. Health Factory Phytoplankton is what you might call an ‘ultra premium’ plankton supplement, the crème de la crème. It is the result of years of lab testing in order to select a strain which is exceptionally high in Omega 3 EPA Phospholipids (ref). Phospholipids are the more bio-available form of Omega 3 oil, much touted in supplements like Krill Oil. Produced in a glass tubed German bioreactor, our plankton supplement is also higher in natural complex minerals and nutrients than any other tested strains. This phytoplankton supplement is packed with PURE EPA OMEGA 3 oil, and is in the fact the highest vegan or vegetarian source of this important fatty acid! How Does Marine Phytoplankton Work? We’ve all read articles which suggest that ‘multivitamins just create very expensive urine.’ While individual absorption rates vary widely, there’s little doubt that a proportion of everything ingested into the body is simply not available to be absorbed. The key factor here is ‘bioavailability’ and, in that field, there is quite simply nothing like phytoplankton. With the rest of the foods we ingest, it is the human body’s mitochondrial system which breaks everything down into proteins, sugar, fats etc. and then eventually into nucleotides: the energy currency of the cell. This process known as mitochondrial nucleotide synthesis results in ATP (adenosine triphosphate) which supplies our bodies with the energy we need to function. According to studies by longevity expert David Wolfe, phytoplankton, containing the smallest particle size of all microalgae, simply bypasses this whole system, delivering ATP directly to cells. For people suffering from Chronic fatigue syndrome, or even everyday exhaustion, this makes it very useful. A teaspoon of plankton powder in water gives has the potential to give you real useable natural energy, without any of the ‘high’ offered by something like coffee. 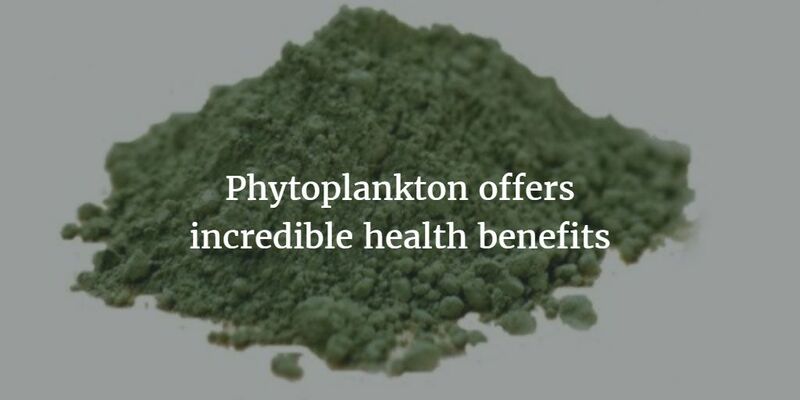 Plankton’s bioavailability means a high propotion of its nutrients, including the phospholipids and omega-3 fatty acids, are able to cross the blood- brain barrier, stimulating significant neurotransmitter production and offering the deep mental clarity with many consumers of phytoplankton powder comment upon. Rapidly gaining in popularity amongst people looking for alternative support in healing from cancer, phytoplankton offers some powerful antioxidant benefits, possibly due, in part, to the microalga pigments. But it’s as a source of Superoxide Dismutase (SOD), an enzyme that appears to breakdown harmful oxygen molecules in cells, marine phytoplankton really shines. This primary internal antioxidant has incredible properties in disarming what are called ‘superoxide radicals’ – rogue oxygen molecules with a prevalent role in many diseases. Although there are detailed studies showing that increased levels of SOD have a direct correlation on human longevity, the problem has always been that Superoxide Dismutase cannot survive the human digestive tract, it is killed by stomach acid. This is where planktons extraordinarily small cell size, once again plays a vital role allowing direct sub-lingual absorption! Put simply, plankton offers you the best natural source of Superoxide Dismutase that can be perfectly absorbed. Amino Acids – Phytoplankton contains the 9 amino acids the body cannot make. Omega-3 Essential Fatty Acids (Eicosapentaenoic omega 3 essential fatty acids) Highest plant source of the long-chain, omega-3 essential fatty acids EPA & DHA docosahexaenoic acid, which are harder to find and much more less prevalent than the short-chain omega-3 fatty acids. Where is our Marine Phytoplankton Cultured? 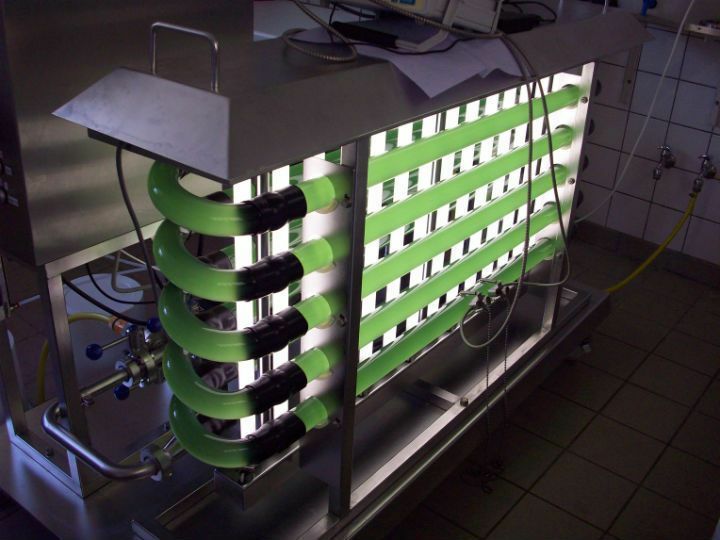 Our plankton is produced in a state of the art closed loop tubular photo bio reactor in Germany. Only the purest filtered water is used, and the tubes are made of glass, rather than the cheaper plastic used by certain competitors. This system is really the Rolls Royce of algae production, with quality control and a sheer passion for what we do at the heart of the process. We produce small batches of what we believe to be the most potent, biologically pure and health-giving phytoplankton on the market today. Are there any Side Effects to Marine Phytoplankton? We’ve written a whole piece on this here but, other than possibly inducing a healing reaction as it’s healing magic begins, we feel this is a gentle supplement with little or no reportable side effects other than superb whole-body health! Until someone shows us a single benefit of any kind to phytoplankton liquid, we’ll continue to produce only our carefully dried and cultured powder, with incredible attention to detail. There’s a reason, to our minds, that spirulina liquid or blue-green algae liquid are not commonly seen items on health shop shelves. Put simply, powder represents the best means of preserving the nutritional components for human health. How to take Marine Phytoplankton? 1/2 teaspoon per day should be enough to get you started. Most people find it affects them most strongly at the beginning and then, as your body starts to come to balance, you need to up it 1-2 teaspoons to achieve the same effects. Which is the best brand of Marine Phytoplankton to buy? We have tested every single plankton supplement available in both the US and within the EU and our conclusion, hands down, is that The Health Factory’s phytoplankton is the best. It is a premium product, more expensive than many, but for a very good reason. Many of our customers have tried one of the cheaper supplements on the market before trying ours but, without exception, none have reverted back afterwards. Your body is the only vessel you’re going to get to carry you through this life – so why give it anything less than the best? Phytoplankton offers a range of exciting benefits for pregnant and nursing women. As one of the world’s most nutrient dense foods, it is a convenient way to ensure your system is deeply nourished, as well as boosting energy levels. It promotes deeper and longer sleep cycles, reduces body aches and, in the case of breastfeeding mothers, appears to have a powerful affect at increasing milk production. The biggest issue for people with leaky gut is their inability to absorb the very nutrients they try to take to heal themselves. When your intestines become permeable your liver also has to work ovetime to filter out all the toxins, and inevitably inflammation follows. Unsurprisingly, leaky gut is enormously common in age of processed food and too many antibiotics. Although not a standalone cure, we believe phytoplankton offers a powerful support to anyone healing themselves for this. It’s complete absorbability make it unique amongst supplements, added to which it’s alkalinic and anti-inflammatory. Is your Marine Phytoplankton Strain ‘Nannochloropsis Gaditana’? Well that would be telling. Although this particular strain has achieved some notoriety as one of the most potent phytoplankton strains being used in the health industry, the one selected by The Health Factory is it’s own special secret. Just try it and feel the difference! Does it help with Grey Hair or Hair Regrowth? Now here’s a strange one. We’ve been getting a number of questions recently from customers who want to know if marine phytoplankton reduces grey hair or even cures baldness. To be honest, this is a new one to us and we can only attest that it hasn’t in our case. That said, the ability of the phytoplankton to deliver it’s benefits to people who’ve struggled with absorbency is something we’re confident of. It is also highly beneficial for the skin and since hair is another overall indicator of the body’s state of health it stands to reason that optimum hair health might be something promoted via a regular spoonful or two of plankton. If anyone has scientific evidence or case studies to support its efficacy in this area we would be interested, please do send it through to our email. What can Phytoplankton do for Joint Pain? There are two main factors in plankton which make it a useful supplement for joint pain. Firstly, it is anti-inflammatory. Ingredients like chlorophyll, certain unique pigments, and it’s omega-3 polyunsaturated fatty acids help reduce the bodies inflammatory load. Secondly, the naturally occurring fatty acid content may stop the system expressing particular proteins which cause arthritis. Many joint pain sufferers find that phytoplankton, especially taken at higher doses (2g upwards per day) can have a profound effect on improving joint mobility, stiffness and discomfort. Is Our Marine Phytoplankton Organic? While we don’t yet have organic certification, our marine phytoplankton is grown in a laboratory environment with zero chemicals, additives, fillers or pollutants of any kind. It is literally the particular strain of the plant we’ve created grown in a salt water solution, and that is it! So to all intents and purposes this is an organic product. Are there Dangers or Negative Side Effects? Buying cheap marine phytoplankton from ocean ponds does carry the risks of pollution, considering how serious the degradation and toxicity of our marine environments now is. 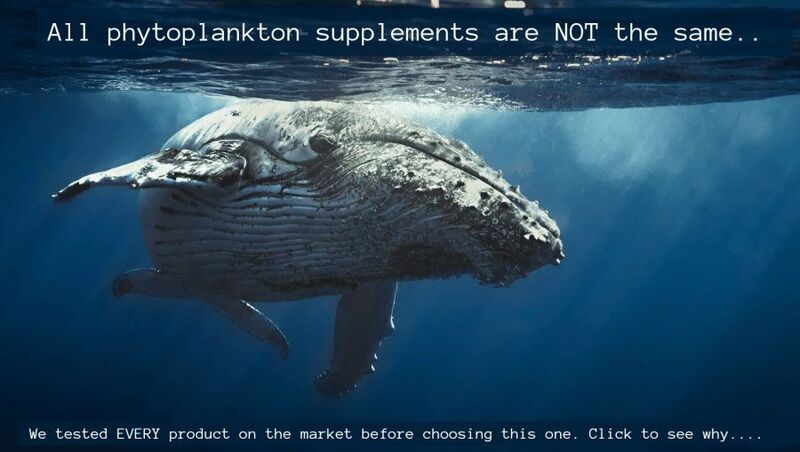 In addition to saying that ocean grown plankton can’t be trusted, we also feel that most of the cheaper commercially produced supplements, even those grown inland, carry risks. Growing phytoplankton in an open pond is only really appropriate for bio-fuel purposes, in our opinion, as they are too prone to contamination. Choosing a phytoplankton grown in the highest quality glass bio-reactor is the starting point for any sensible buying decision. Following on from that you need to be assured of quality control throughout every stage of the process, including the drying and packaging. That’s just one of the many reasons, we’re confident that the Health Factory is the current best choice on the market.